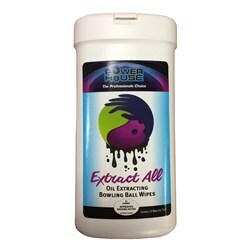 Powerhouse now introduces Extract All Wipes -- the easiest way to remove excess oil from your bowling ball! The invisible enemy of your ball's performance is the oil applied to the surface of the lane, which soaks into the porous surface of the ball and negatively affects its performance. Powerhouse Extract All Wipes use a micro-pore penetrating action that safely restores and increases oil absorption in all reactive bowling balls. These work by increasing your ball's oil absorption which creates increased friction. That increased friction gives a better hook which leads to a better entry angle and more STRIKING POTENTIAL. 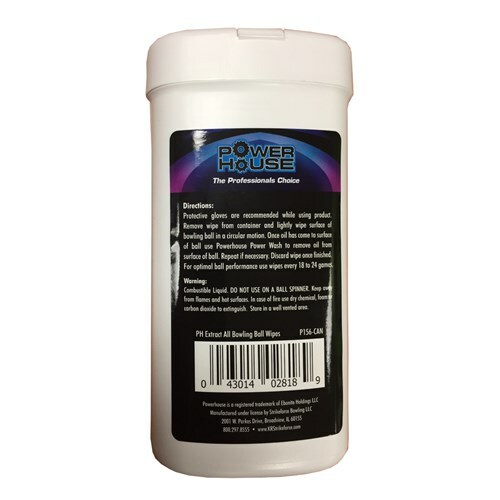 You should manage your ball's performance by cleaning every 3-6 games with an approved cleaner like Powerhouse Power Wash and wiping your ball with Powerhouse Extract All Wipes every 3-6 games to enhance and prolong your ball's performance. Travels well for tournament bowlers. Made from environmentally-friendly, natural elements. After cleaning the GB3, we wiped the ball with an Extract All Wipe & let it set on the coverstock for a few minutes. You can immediately see the oil bead up on the exterior surface of the ball. After cleaning the Extract All Residue with Powerwash, the coverstock was returned to its original condition. Just to make sure, the the ball was cleaned a 2nd time an Extract All Wipe & no oil was found in the ball. Great product. Simply follow the instructions & it works well! 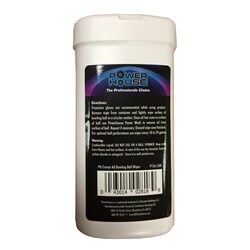 Due to the time it takes to produce the Powerhouse Extract All Oil Removing Wipes ball it will ship in immediately. We cannot ship this ball outside the United States.